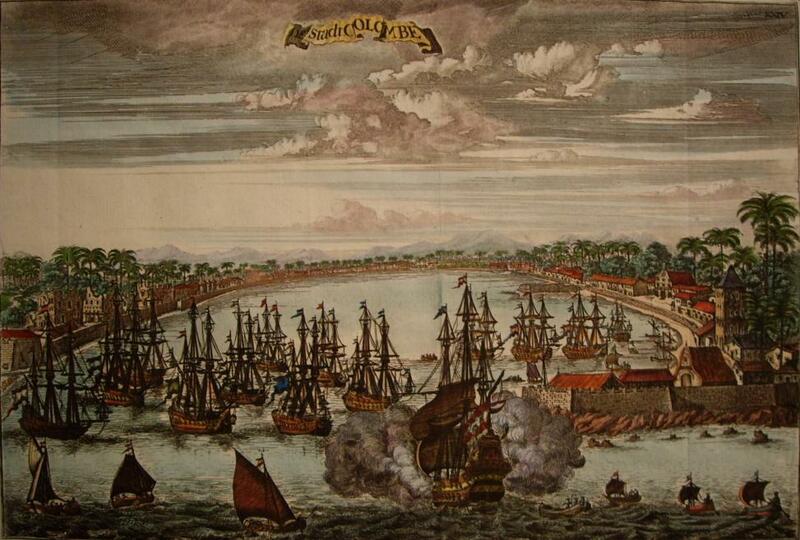 Colombo, with its natural harbour and cinnamon exports was known to ancient sailers for over 2,000 years. For much of its history, it was a small seaport settlement visited by sailing vessels of Indians, Arabs, Persians and Chinese while on their Indian Ocean silk route trade. Arabs began to settle in Colombo around the 8th century AD, mostly because the port helped their business by the way of controlling much of the trade between the Sinhalese Kingdoms and the outside world. According to historical sources, adventurous and pious Arab traders used to carry on a lucrative trade between the Orient (i.e. Asia) and the European ports in the Mediterranean in elephants, pearls, gemstones and spices during the period between the first and sixteenth centuries. This was a period when the Arabs had established lucrative trading posts on the Western coastal belt of Sri Lanka from Puttalam, in the North West, to Hambantota, in the South. 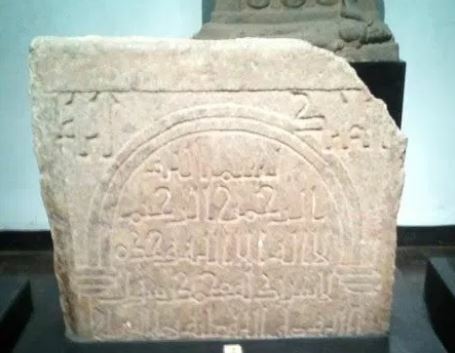 One of the earliest physical evidence to Muslims in Colombo is a gravestone inscription in Kufic characters discovered in the old Colombo Muslim cemetery. Here is a photo of that gravestone currently at the Colombo National Museum. Museum description says, “Sir Alexander Johnston Inscription refers to a Muslim preacher sent to Colombo by the Caliph of Bagdad. The tomb-stone is dated to Hijra year 337 (948 AD) and belongs to the preacher In Abu Bakasa (or Nakasa) showered with blessings of the God.” (Description Source: Colombo Museum.) For more, see 1100-year-old Colombo Muslim Stone Inscription. Famous Arab traveler Ibn Batuta who visited the island in 1341-1344, referred to Colombo as ‘Kalanpu’. Further during Ibn batuta’s visit a Muslim ruler called Jalasthi is reported to have been holding Colombo, maintaining his hold over the town with a garrison of about 500 Abyssinians (Ethiopians). The rise of Colombo as the island’s main political and commercial center began during the reign of His Majesty, King Vikramabahu III of Gampola. Minister Alakesvara (1370–1385) built a fortress in the nearby large swamps of Colombo to checkmate the invasions from South India on the western coast. He named the fortress Jayewardhanapura, and the area became known as Kotte (“The fort” in Sinhala). In 1412, His Majesty, King Parakramabahu VI made Sri Jayawardenepura Kotte his capital city. Thus nearby Colombo became the most important port in the country. His Majesty, King Parakramabahu VI was one of our greatest kings. He was our last King to rule the whole of Sri Lanka. 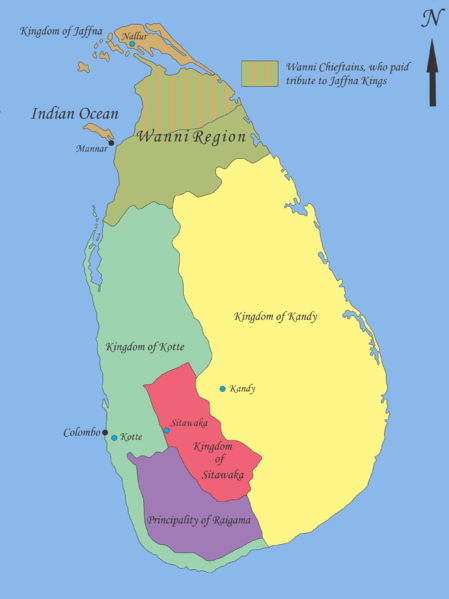 Kotte Kingdom’s downfall began with an event in 1521 which became known as the “Wijayaba Kollaya”. In 1505, when the Portuguese, piloted by the Moors, came to Colombo from Galle, they saw two white-washed Mosques there. It is recorded, “The first Portuguese to put into Colombo did so by accident. Don Laurenzo de Almeida, son of the Viceroy, Fransisco de Almeida of Goa, set out from Cochin, in the month of November 1505, with nine sailing ships and made for the Maldive Islands, hoping to intercept Moorish ships bound for Makkah. Being carried away by a storm and reaching the Port of Galle, and after victualling, the ships followed the coastline, Northwards, to the Port of Colombo in which the anchored, causing much astonishment to the natives and tremendous grief to the Moors. Mr. R.L. Brohier wrote, “a flotilla of eight Portuguese sailing vessels anchored in the Bay (Colombo) on November 15, 1505, the Commander of the expedition saw, beyond a rummage of masts and spars of smaller shipping and off the shore marred by a crescent of sand, clusters of huts hidden by foliage, some cadjan godowns and two limewashed Mosques.” This description of Colombo along with the below illustration of Colombo has been reproduced by Mr. R.L. Brohier in his “Historical Series” – No 1, and appears on the front of the book. 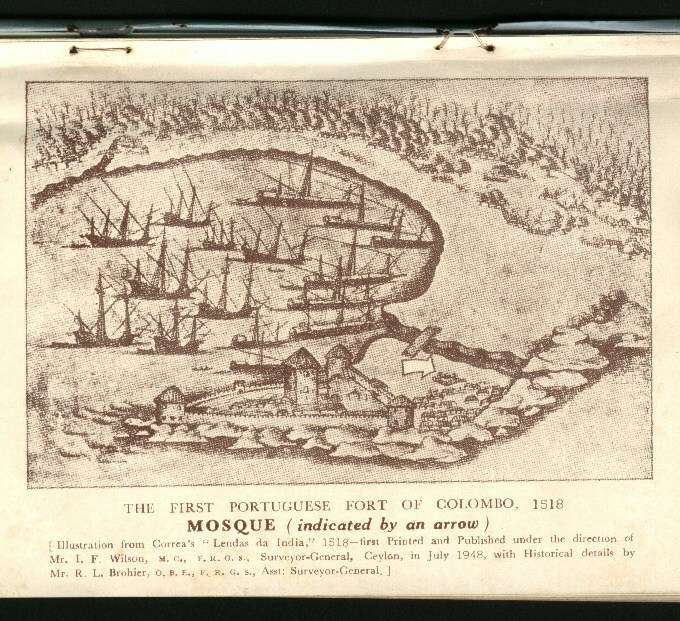 The one of the oldest reference to a Mosque in Colombo is contained in this illustration of the first Fort of the Portuguese which was built in 1518 (see map above). The precise location of these Mosques are doubtful. There was one at Gabokka where the new lighthouse stands. The other could have been the Grand Mosque at New Moor Street, being situated on a hill and hence visible from the sea. According to another version, there was a Mosque on the hill at Wolvendhal, and that part of Colombo was an open space fully visible from the sea. This Mosque was being used by Arabs for prayer, who had their go-downs, moored, in the harbor. The had complete freedom in the Island and a large majority of them monopolized the coastal areas in order to be in close contact with their sailing vessels. In 1520, King Vijaya Bahu who was not opposed to the Portuguese establishing a trading post in Colombo, was alarmed at their effrontery in trying to dominate the sea-board by building a Fort in Colombo. He, therefore, launched an attack on the Portuguese. The continued friction between the Sinhalese and the Portuguese, and, the latters inability to compete with the Moor’s in trade in the interior parts of the Island made their position in Colombo rather precarious. Hence, when Vasco da Gama came to India (second Viceroy in 1524) he had orders from the King of Portugal to dismantle the Fort of Colombo, leaving only a factory there. 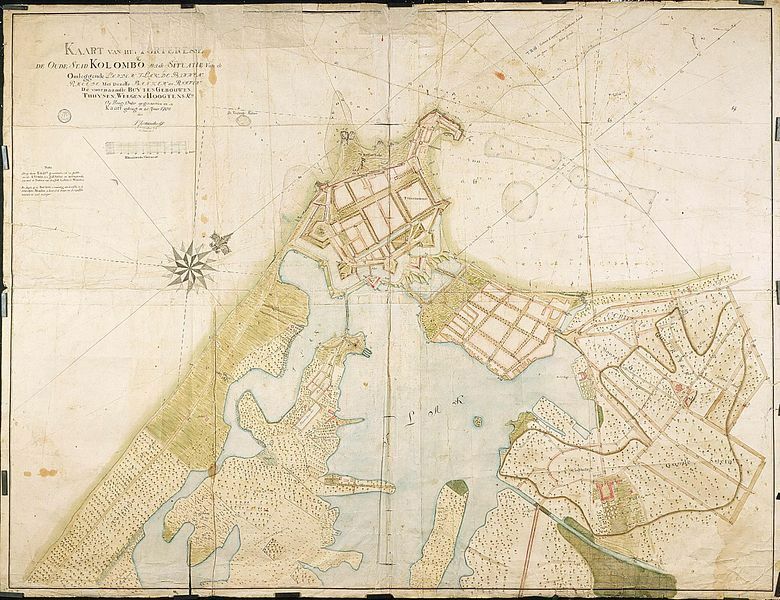 The Fort was, therefore, razed to the ground and the garrison and artillery were moved to Goa in India. This was an occasion of great joy for the Moors, who, in gratitude to Almighty Allah, re-built a small Mosque in Colombo. There is also a strong tradition to show that the new Mosque was built on the identical spot where the demolished ones stood thus implying that the present day Colombo Grand Mosque must have a history of more than 500 years today. The advent of the Portuguese brought intolerance and business rivalry and the Moors had to move to the outskirts of Colombo by a “Road to Cotta”, now called Maradana Road, and settled therein. The more powerful and wealthy of them mustered strongly at Moorish quarters at Grand Moor Street (ie the Pettah section of Main Street), New Moor Street, Old Moor Street, Dam Street and Messenger Street. In later years the Portuguese found that it was to their advantage, commercially, to tolerate the Moors and hence they began to enjoy a considerable amount of freedom. In spite of definite instructions from the Portuguese Provincial Council in Goa and the Roman Catholic dignitaries against employing Moors by the Christians, many Moors were still appointed as Vidane’s (Headmen) etc. by the local Portuguese. In his,”Ceylon: The Portuguese Era”, Dr Paul E Pieris states that even in Colombo there was a Moorish tailor named Belala, who, by 1625 had resided for thirty years and had also amassed great wealth. On the occasion of the marriage of his daughter to another Moor, the wedding procession paraded through the city at night and several Portuguese had also decorated and illuminated their houses and also joined in the procession. One of the influential Portuguese residents had even sent one of his African slaves to slaughter the cattle according to Islamic Shariah rites for the marriage feast. This brief description is more than sufficient to prove the existence of a flourishing Muslim community where this old Mosque played a significant part in their social, cultural, and religious requirements. This flourishing era for the Moors of Colombo was not destined to last for long. When the Dutch had dispossessed the Portuguese of their territory in Ceylon, there commenced one of the darkest chapters in the history of Sri Lankan Muslims. The Dutch, who captured Colombo in 1658, were not prepared to tolerate the Muslim Moors for two main reasons. First, because they were of an alien faith, and next, because this Dutch Governorate was established in present-day Sri Lanka by the Dutch East India Company. They were solely intent on earning as much wealth as they could and hence would not tolerate any rival or competition in their trade, unlike the Portuguese. Thus many oppressive laws were passed against the Moors preventing them from residing within the limits of Colombo and other towns and also preventing them from acquiring land and property within these towns. The Moors were thus compelled to keep away from the town and concentrate on their trade with the indigenous people of the interior. It was only after the coming of the British to Ceylon that all nationalities were treated somewhat alike irrespective of caste, creed or numbers. The late C.J. Van Sanden in his book,”Sonahar”, states, “It would appear that as early as 1804 they (Moors) had so succeeded in enlisting the sympathy of the Britisher that a resolution was passed on 5th August, publishing a code of Muslim laws which were observed by the Moors residing in the area known as the Province of Colombo. It will be noted that while the Portuguese and the Dutch did everything that was possible to disregard the rights of the subjects and wantonly wound their susceptibilities, the diplomatic Englishman took them under his sheltering protection.” Some of the Moors began to flock to Colombo and settle, especially, around Pettah, gradually replacing the Dutch residents. In 1820s, the Dutch Indonesian exile minister Hooloo Balangkaya, who has been mentioned earlier, had a son named Muhammad Balangkaya who displayed a great interest in the Moorish community. In spite of the objections and protests of his relatives and friends he had married a Moor lady, and through this marriage he had six sons and three daughters. Muhammad Balngkaya was an Architect by profession and was also a pious Muslim. He found the small Mosque in New Moor Street inadequate for congregational prayers, and by enlisting the support of many of his rich Moorish co-religionists, he had the Mosque enlarged and renovated to a two-storey building, designed entirely by him. This is the present Colombo Grand Mosque, and was the first of its kind in Colombo, or probably in all of Ceylon at that time. In 1826, when the re-building of the Colombo Grand Mosque was completed, the then British Governor of Ceylon, Lieut. General Sir Edward Barnes, GCB, visited and highly commended Muhammad Balangkaya on the excellence of his work. 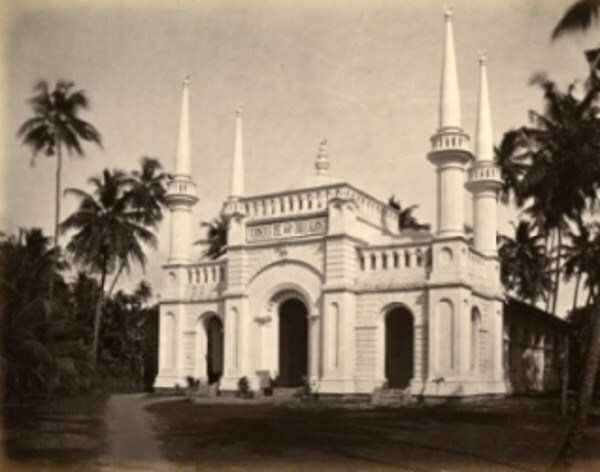 The Akbar Masjid, located on Kew Road in Slave Island, was built in 1859. According local accounts this mosque had been surrounded by Beira lake when it was established. As told by a sixth generation trustee of the Akbar Mosque, the origins of the founders of the Akbar Mosque trace back to the story of a South Indian horse merchant by the name of Talep Akbar who resided in Slave Island. Collecting money from local Muslims, the Akbar Masjid was built of sandstone and sand. 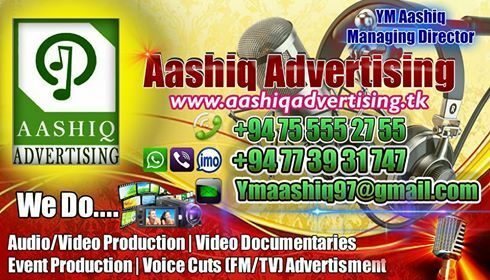 His son Mas Sooma Jayah Akbar was a member of the Colombo Municipal Council representing the Wekande Ward. One of his grandchildren, the late Justice M T Akbar was a Member of the Legislative Council. There also used to be a Muslim burial grounds (cemetery) that was present within the premises of the Colombo Grand Mosque. This was discontinued on October 21, 1874, on the orders of the Government. On Aug 12, 1875, a block of land of over 1.25 acres in extent was purchased in Maradana by the Colombo Grand Mosque not only for the purpose of building a Mosque but also to be used as a cemetery for the burial of the dead from amongst the members and families of the congregation of the Mosque. This new burial ground was used for burials after the closure of the cemetery at the Colombo Grand Mosque. Burial was discontinued here too and the present “Maradana Small Mosque” on Symonds Road was built on this site. The Malay Military Mosque in Slave Island was founded in 1864 and erected its present structure in 1921. It is a testimony to the existence of Dutch mercenary soldier trade from Java to the rest of the world before the First World War. The mosque is famously known as the ‘Rupee Fund Mosque’ as each mercenary soldier based in the area (of Java descent) contributed a rupee to the establishment of a mosque in the area. It is known as the Malay Military Mosque instead of Java Military Mosque as the Malay language served as the lingua franca for military personnel from South East Asia who was located in Slave Island either in mercenary or Police positions. In 1870s, begins the story of Jawatte Mosque in Torrington Avenue, Colombo 7. Today, Jawatte Jummah Mosque and the Burial Grounds is made up of two distinct and independent properties. The ‘front’ section on which stands the Mosque, Hostel, Car Park and a part of the Burial Grounds was donated by Oeduma Lebbe Mohideen Abdul Cader in September 1876 to the Muslim Community by Deed of Gift to be used primarily as a Burial Ground for all members of the ‘Mohammedan Faith’. The ‘rear’ contiguous section was donated by it’s owner, Masjid-ul-Jamiah, the well-known Malay Military Mosque located in Java Lane, Kompanyaweediya (Colombo 2) in 1876 for the same purpose. With the subsequent vesting of these properties on the Wakf Board, for administrative purposes, these two blocks of land were treated as one unit coming under the purview of the Board of Trustees of the Mosque. Its possible that Jawatte in Colombo 7 gets its name from the slave island Ja or malay community buying up the land here for their burial grounds. The first proper Mosque was built at the premises of the Jawatte Burial Grounds in 1941. This event was announced in the Times of Ceylon newspaper of 22nd August 1941. Until this time the Malay and other Muslim communities around slave island seem to have been using the present Wekenda Mosque premises as a Muslim burial ground. That burial grounds might have met the same fate of Colombo Grand Mosque. Hence the establishment of the present Wekanda Mosque in 1875 in that location while the Jawatte served and continues to serve as the Muslim burial grounds for Slave Island and Colombo 3-7. The present Maligawatte Muslim Burial Ground was purchased on October 12, 1874 by the Grand Mosque and this land became one of the main Muslim cemeteries in Colombo from this date and is in use even today. This article is a work under progress. We are working on improving this work to make it a comprehensive history of Colombo and Muslims as possible. We welcome your comments, suggestions, corrections and most importantly any content, historical details and photos you can provide. Thank you. We would like to thank Mr. Fazli Sameer for generously giving us permission to use all material contained in his, “Sri Lanka Genealogy” websites and blogs.